Completely updating the look of your favorite rooms is affordable and enjoyable when you shop our stylish collections. Installing vinyl flooring--also known as luxury vinyl tile--is the perfect way to add a touch of class and sophistication to your home for a price you’re sure to love. Vinyl tile flooring is one of our most popular floor options, and for good reason: its touch of style enhances any room in your home. Whether you’re updating your existing home or moving into a new home, depend on our vinyl sheet flooring experts for inspiration, information, and expertise. We’re dedicated to partnering with you throughout every step of the flooring process, from selection to installation. When you visit us in our showroom, we’ll show you our excellent variety of vinyl plank flooring and help you find the floor of your dreams. Whether you’re working on a very strict budget or have a precise vision in mind, we’re confident that we’ll find the perfect flooring to meet your needs. Every home has a distinct and unique personality, which is exactly why we make sure to carry an impressively large variety of vinyl floors. It’s important to us that you find the perfect floor style to complement the existing décor and atmosphere of any room in your home. 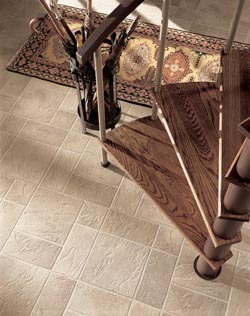 We are proud to offer so many varieties of vinyl tile flooring. Regardless of your decorating plans, you can trust that we’ll have the right floor style for you. Our inventory includes flooring manufactured by some of the most respected and recognized brands in the industry. Your new, high-quality vinyl floors are sure to rejuvenate the look of your home, impress your friends, and last well into the future. Luxury vinyl tile is known in the flooring industry for perfectly mimicking the appearance, feel, and texture of other highly coveted and high-end flooring materials. Many of our customers choose vinyl sheet flooring for its ability to resemble a variety of floor types, including hardwood planks and marble tiles. In addition to its wonderful versatility, vinyl flooring is ideal for homes with children, pets, or high levels of foot traffic. Luxury vinyl tile is an excellent option for customers who are looking to stay within a specific budget, while still receiving an expensive and refined look. Visit us today at our conveniently located store and showroom to start perusing our selection of vinyl tile flooring. Vinyl plank floor gives you the look of hardwood at a cost-effective price Vinyl plank flooring requires virtually no maintenance. You can have the look of your favorite wood species, complete with whorls and grain patterns that make it even more realistic. Plus, to properly clean this variety of flooring, all you need to do is simply sweep and mop. With this easy maintenance routine, your floors will stay pristine for years. In addition to being convenient and easy to maintain, vinyl planks are immensely durable, and resistant to stains, scratches, and dents. After your vinyl flooring installation, you’ll never need to worry about your children, visitors, or pets accidentally scratching or staining the floor. Vinyl floors are extremely pet- and family-friendly. These floors are also the perfect flooring option for areas with higher levels of moisture, including bathrooms, kitchens, and basements. There’s no need to worry about excess water ruining your new floor. You’re sure to love the peace of mind you receive from knowing that your investment is guaranteed to pay off. Everyone loves saving both time and money! We’re here to make that a reality for you. When you depend on our experienced crew to install your new floor, you receive the highest levels of service and impeccable workmanship. We love taking on all flooring projects, regardless of their size. Whether you have a large or small floor that needs updating, count on us to complete the installation in a timely manner. Our skilled technicians take the time to expertly clean and prepare the subfloor before precisely measuring and laying your floors. By paying attention to detail and being meticulous during the installation process, we ensure that your new floor will last for years. When quality flooring materials are installed incorrectly, the chances of costly future repairs and replacements are significantly increased. We’re committed to protecting your home improvement investment by making sure your vinyl flooring installation is done right the first time. You deserve only the best when it comes to customer service. From the moment you call us or walk through our front doors, you can rely on us for friendly service, advice, and support. We’re dedicated to making your floor shopping experience as rewarding and stress-free as possible. We understand that shopping for home improvements can be overwhelming and time-consuming. Our employees have an extensive knowledge of all our vinyl flooring brands, meaning that we can answer all your questions in a timely fashion. We have the expertise to recommend styles, brands, and options that work best for your lifestyle, budget, and existing décor. By committing ourselves to impeccable and efficient customer service, we make it easy and enjoyable for you to select the perfect vinyl sheet flooring for every room in your home. The satisfaction of our customers has always been our top priority. We are so confident in the work of both our installers and our in-store staff that we offer a unique promise known as our Ultimate Confidence Guarantee. This promise means that if you are unhappy with any aspect of your new floors within 30 days, we’ll be more than happy to replace the floor with a comparable product free of charge. Ready to start shopping for the floors of your dreams? Call <PHONE>, or visit our store and showroom location at your earliest convenience. We proudly serve the flooring needs of Ankeny, Saylorville, Bondurant, Altoona, and Elkhart, Iowa, plus all of the surrounding areas.